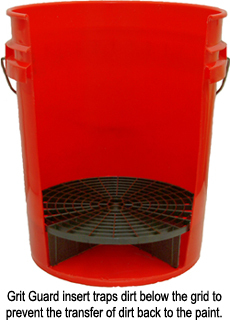 The Complete Wash System with Dolly includes a Grit Guard, a raised grid surface that stands about 2.5 inches off the bottom of the bucket. Fill the bucket with your favorite shampoo and water. Load your mitt with soapy water and wash as usual. When you dunk the mitt back in the bucket, drag it across the grid to remove dirt that has accumulated in the nap.The dirt will fall into the grid’s four quadrants and settle in the bottom of the bucket. Even though you agitate the top water every time you reload the mitt, the Grit Guard® stabilizes the water in the bottom of the bucket so the dirt does not rise. Simply stated, your wash water stays clean so your mitt stays clean. Clean mitts mean no swirls!